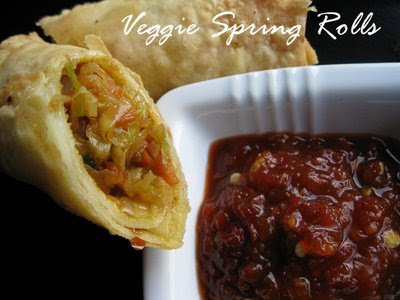 I had made Veggie Spring Rolls last week, the Indian way. Here Spring rolls are made with the ready to use wanton wrappers, but the spring rolls back in India are made with thin crepes, which are filled, rolled and then deep fried. The outer layer is crisp and soft at the same time, and makes the roll heartier compared to the very crisp wanton wrapper. Make the Crepes: Mix all of the ingredients for the crepe using water as required to make a smooth batter. The batter should be of pouring consistency. Heat an 8” wide non-stick skillet, spray with cooking oil, pour about ¼ cup of the batter in the centre of the pan. Lift pan and gently swirl it around in an anti-clcokwise direction, to help spread the batter evenly across the pan. Cook on medium heat, for a minute or two on each side. Prepare all crepes. Store crepes in between paper towels. Make the Filing: Heat the sesame oil in a pan. Add the minced ginger and garlic. Saute till fragrant. Now add the shredded cabbage and carrots. Cook till cabbage and carrots have wilted down and are soft. Stir in the soy sauce and the chopped scallions. Saute for a minute, adjust seasoning and turn off heat. Let filling cool before using. Heat oil in a deep pan. Take a crepe; place 3 tbsp of filling breadth wise on the crepe. Take the edge closest to you and flip over the filling tightly; now take the right and left edges and bring over the first fold to close the edges. This ensures the filling stays inside when frying. Roll all the way till it forms a tube. Moisten the open edge with the flour paste, and seal. Drop in hot oil sealed side down. Fry until light brown, flip once to cook both sides. Remove and drain on paper towels. 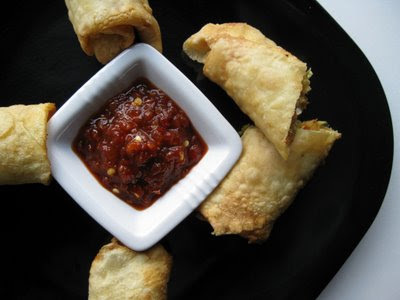 Cut across at an angle and serve with more hot sauce or a sweet dipping sauce. hmm im drooling now nams:-) i love spring rolls esp the indian ones.. thanks a lot for the recipe!! Like nags saysi too buy ready made spring roll pastry and yourlooks soso yummy delicous. Spring roll looks delicious, Indian style too. I am on break too until June, see you then. Who can say no to spring rolls! Yum! Namratha, I didn't know about these crepes until now. I too buy the pastry and we bake it. Thanks a bunch for leaving a comment. I am now a loyal fan of your culinary creations!